PURPOSE: The main purpose is to study the treatment outcomes of zone 1 retinopathy of prematurity (ROP). 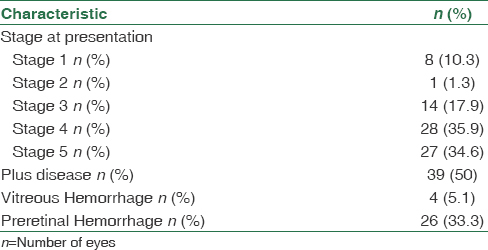 MATERIALS AND METHODS: A retrospective analysis was done of infants diagnosed with zone 1 ROP with any stage with or without plus disease who were treated with either laser photocoagulation and/or intravitreal injection of antivascular endothelial growth factor (anti-VEGF) agents and/or underwent surgery according to their stage at presentation. The retinal outcome at the final visit was analyzed. A favorable outcome was characterized by an attached retina at the posterior pole with regression of ROP (regression of plus disease as well as new vessels) while an unfavorable outcome was detached retina at posterior pole in spite of treatment. RESULTS: Seventy-eight eyes of 39 infants presented with zone 1 ROP in various stages with plus disease in 50% cases. About 60 eyes underwent treatment. Forty eyes (66.6%) had an attached retina at the final follow-up. 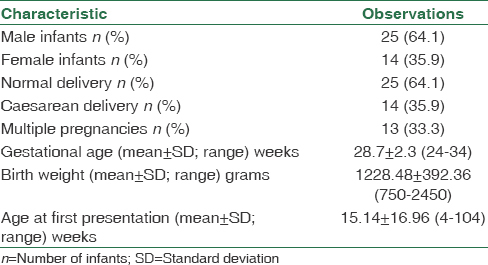 Thirty-three eyes (55%) underwent monotherapy with 14 eyes (23.3%) showing regression of ROP with laser alone. Nineteen (31.6%) eyes were treated only by surgery. Of these, a favorable outcome was seen in four eyes (44.4%) with Stage 4 disease and three eyes (30%) with Stage 5 disease. None of the eyes received anti-VEGF as monotherapy. A combination of two or more modalities was required in the remaining 27 eyes (45%). Six eyes (10%) needed anti-VEGF injections in addition to laser and six eyes needed surgery in addition to laser to achieve a favorable outcome. Six eyes (10%) required surgery in addition to both laser and anti-VEGF therapy, and one eye (1.6%) required surgery in addition to anti-VEGF therapy for a favorable final outcome. Among the eyes undergoing treatment, 66.6% had a favorable outcome with 92.9% of eyes in Stage 3, 59% in Stage 4, and 33% in Stage 5 showing regression of disease and attached retina. CONCLUSION: In spite of the aggressive nature of zone 1 ROP, favorable outcome is possible as was seen in 66.6% of our cases. A multipronged approach using a combination of laser, intravitreal anti-VEGF agents with or without surgery may be necessary for the management of these eyes. Retinopathy of prematurity (ROP) is a retinal vascular disease commonly seen in premature infants. With improved and advanced neonatal care and respiratory support available today, the survival rate of premature babies has increased, exposing these babies to increased risk of ROP. Zone 1 ROP is a severe form of the disease and accounts for 10% to as high as 35% of all the treated ROP cases., It is characterized by rapid progression of the disease from Stages 1 to 3 within a matter of days and has a tendency to progress to retinal detachment with extremely poor visual outcomes if not treated promptly. Both cryotherapy for ROP and early treatment of ROP studies demonstrated poor outcomes in spite of treatment for zone 1 ROP as compared to zone 2 ROP.,,, Current treatment modalities available for this disease include laser indirect ophthalmoscopy, vitreoretinal surgery, and intravitreal injection of anti-vascular endothelial growth factor (anti-VEGF) agents.,,,,,, The present study describes the role of all the current treatment modalities either alone or in combination for management of zone 1 ROP in a real-world clinical practice at a tertiary care center. A retrospective-descriptive analysis of infants diagnosed with zone 1 ROP and referred to a tertiary eye care center in South India was done. The eyes were classified according to the International Classification of ROP. Inclusion criteria were eyes with zone 1 ROP presenting with any stage of the disease with or without the presence of plus disease. Zone 1 was defined as a circle, centered on the disc, whose radius was twice the distance from the disc to the macula. Active zone 1 disease was characterized by abnormal closed-loop shunts and/or flat new blood vessels or presence of a ridge with new vessel formation. Plus disease was characterized by the presence of one or more of the following features: nondilating pupil, persistent tunica vasculosa, vitreous haze, and dilatation or tortuosity of the posterior pole blood vessels. Eyes with zones 2 or 3 diseases were excluded from the study. The infants satisfying the inclusion criteria for zone 1 ROP were treated with laser photocoagulation to avascular retina and/or intravitreal injection of (anti-VEGF) agents and/or underwent surgery according to their stage at presentation. The babies were examined on referral from neonatologists and ophthalmologists and also screened at neonatal intensive care units in various other hospitals. Examination of the infants was carried out after informing and explaining the procedure to the parents. Treatment of these babies was done as per the neonatal forum guidelines, New Delhi. The study was approved by the Institutional Review Board of the Institution, Medical Research Foundation, Chennai, and adhered to the tenets of the Declaration of Helsinki. Laser treatment was done for active zone 1 disease under topical anesthesia (0.5% proparacaine) in the operation theater in the presence of an anesthetist with continuous monitoring of the heart rate and respiration of the child. Laser guidelines followed the protocols of Jalali et al. Pale white laser burns were applied in the areas of avascular retina extending from the ridge of extraretinal fibrovascular proliferation to the ora serrata, half burn width apart. Laser was applied in multiple sessions if necessary. The infants were followed up every 3–7 days. Eyes showing progression or incomplete resolution of disease in spite of adequate laser were considered for treatment with intravitreal injection of 0.625 mg in 0.025 ml bevacizumab (Avastin®) and/or vitreoretinal surgery if tractional retinal detachment was seen. Intravitreal injections were given using a 30G needle, 1 mm away from the limbus under topical anesthesia and aseptic precautions in the operation theater. Surgical intervention was done if Stage 4 or 5 ROP was seen with or without vitreous hemorrhage. The surgeries performed were vitrectomy with lensectomy (LV) or lens-sparing vitrectomy (LSV). All surgeries were done under general anesthesia. Sclerotomies were made for infusion in the inferotemporal quadrant and in the superior nasal and temporal quadrants 1–1.5 mm from the limbus. Vitrectomy was done without base excision using binocular indirect ophthalmomicroscopy. Attachments to fibrovascular proliferation were trimmed. A combination of peeling, delamination, and segmentation was done to remove the preretinal fibrous tissue to the extent possible. The aim of the surgery was to achieve adequate traction relief. No attempt was made to separate the posterior hyaloid from the retina. A 25G chandelier illumination was used for bimanual surgery if required. All sclerotomies were closed with 7–0 vicryl suture. Sclerotomies were made at 10 and 2 o' clock positions, 0.5 mm from the limbus. LV was done. Retrolental membrane when present was opened up in a cruciate manner with a 26G needle and/or curved scissors and forceps from the upper sclerotomies. Viscoelastic was used for posterior membrane dissection when required. An anterior chamber maintainer was used for infusion for better control of intraocular pressure. No attempt was made to drain the subretinal fluid. All sclerotomies were closed with 7–0 vicryl suture. Babies were followed up periodically and were evaluated for regression in ROP as well as their retinal status. The infants with minimum of 2-month follow-up were included in the study. The structural retinal outcome at the final visit was analyzed. A favorable outcome was characterized by an attached retina at the posterior pole with regression of ROP (regression of plus disease as well as new vessels), while an unfavorable outcome was one in which a detached retina at posterior pole was seen in spite of treatment. The analysis was done using Microsoft Excel (2007) and Statistical package for the social sciences (SPSS) software version 15 (SPSS Inc, Chicago, IL, USA). A total of 78 eyes of 39 infants with zone 1 ROP were analyzed. Out of the 39 babies with bilateral disease, there were 25 males and 14 females. Twenty-five babies were born by normal delivery while 14 were born by cesarean section. Thirteen were born of multiple pregnancies while 26 were single pregnancies. The mean birth weight was 1228.48 (± 392.36) g with nearly 18% of the babies with birth weight ≥1500 g. It is noteworthy that nearly 77% of children with zone 1 disease presented to us late (>6 weeks after birth). The median age at presentation was 9 weeks while the mean gestational age was 28 weeks (range: 24–34). The associated systemic problems are shown in [Table 1]. The demographics are summarized in [Table 2]. At presentation, 8 eyes were categorized as Stage 1, 1 eye as Stage 2, 14 eyes as Stage 3, 28 eyes as Stage 4, and 27 eyes as Stage 5 [Figure 1]. Plus disease was present in 50% of the cases. About 5.2% of the eyes had vitreous hemorrhage at presentation while 33.3% had preretinal hemorrhage. These characteristics have been summarized in [Table 3]. The details of the treatment done in various stages of ROP are given in [Figure 2]. Fourteen percent of eyes (two in Stage 4 and nine in Stage 5) were found to be inoperable and 9% of eyes (seven eyes) did not undergo surgery. Of these seven eyes, four were Stage 4 and three were Stage 5. Parents of these children refused surgical intervention either because of poor visual prognosis or high risk involved in general anesthesia owing to associated systemic problems. All these eyes (23.1%) had a poor final outcome. Sixty out of 78 eyes underwent treatment in the form of laser, intravitreal bevacizumab, surgery, or a combination of two or all of these modalities. Fourteen eyes (23.3%) showed regression of ROP with laser treatment alone although multiple sittings of laser were necessary (1–4). Six (10%) eyes needed anti-VEGF injections in addition to laser and six eyes needed surgery in addition to laser for regression of ROP and favorable outcome. 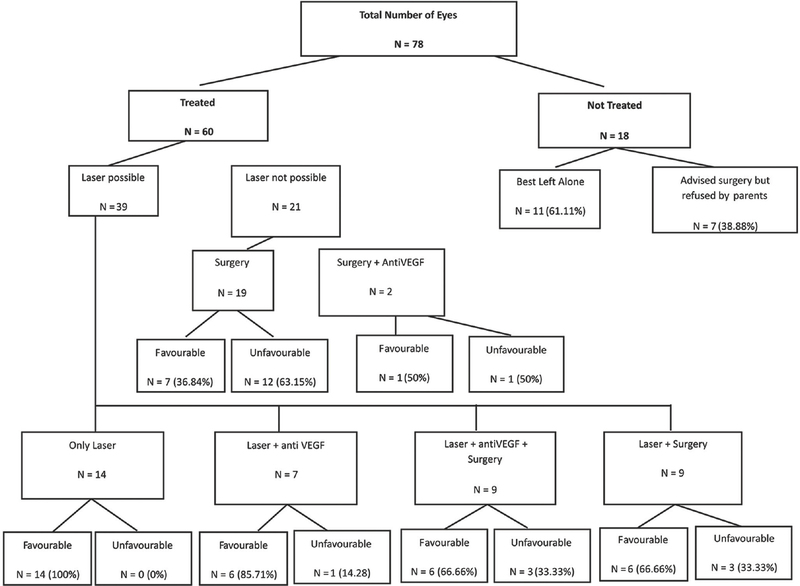 Ten percent of the treated eyes required surgery in addition to both laser and anti-VEGF therapy for regression of ROP and had a favorable final outcome with an attached retina. While good response to therapy was seen in Stage 1 (100%), Stage 2 (100%), and Stage 3 (92.9%), the poor outcomes were associated with advanced Stages of 4 (59.1%) and 5 (33.3%). Nineteen eyes (31.6%) were treated only by surgical intervention without prior laser or anti-VEGF due to the advanced nature of the disease. Among them, nine eyes had Stage 4 while ten eyes had Stage 5 disease. A favorable outcome was seen in four eyes (44.4%) with Stage 4 disease and three eyes (30%) with Stage 5 disease. In total, 18 eyes were given bevacizumab. None of the eyes received anti-VEGF as monotherapy. Seven eyes were given anti-VEGF because of inadequate response to laser alone and in two eyes, injections were given before the surgery. Nine eyes needed surgical treatment despite maximal treatment with laser as well as anti-VEGF injections. The mean follow-up was 12 months (range: 2–48). Of the 78 eyes studied, treatment was given to 60 eyes (77%) in the form of laser, surgery, and/or anti-VEGF agents. Of them, 40 eyes (66.6%) had an attached retina at the final follow-up, indicating a structurally favorable response to treatment. A detached posterior pole was seen in 20 eyes (33.3%) that were treated, indicating an unfavorable structural response in them [Figure 3]. Our study demonstrated the anatomical outcomes following treatment in 78 eyes presenting with any stage of ROP with zone 1 disease. Out of the 60 eyes which underwent treatment in the form of either laser, anti-VEGF, vitrectomy, or a combination of any of these, 40 eyes (66.6%) achieved a favorable outcome with attached retina at final follow-up. Aggressive posterior ROP (APROP) represents the most aggressive form of disease and timely management inclusive of multiple modalities of treatment can have beneficial outcomes. Our study cohort of zone 1 ROP was characterized by late presentation (in nearly 77% of eyes it was after 6 weeks) of the infants as well as stormy neonatal course including respiratory distress syndrome (RDS) seen in 90% of infants weighing <1500 g and in 85.71% of those who were ≥1500 g at birth. Association of RDS with increased incidence of ROP has been seen by other researchers as well. Vitreous hemorrhage was seen in 5.2% of eyes and preretinal hemorrhage in 33.33%. Fifty percent of the eyes in our study had plus disease, and this was seen more frequently in eyes with Stages 3 and 4 (68.6%), making laser treatment difficult. All these are additional risk factors for severe ROP. Of the 78 eyes studied, treatment in the form of laser, surgery, anti-VEGF agents, or a combination was done in 60 eyes (77%) depending on the retinal vascularity and stage of ROP at presentation, response to initial treatment, and progression despite initial treatment. Fourteen percentage of eyes were non salvageable at presentation because of the advanced stage of disease (Stages 4 and 5). Laser was possible in only 65% of eyes. This reflects the vital time lost in referring and bringing the child to a tertiary care center because of lack of facilities in peripheral areas. Laser photocoagulation is the gold standard for treatment of ROP. The milder forms of ROP have a regression rate of up to 94.11% with laser, while more severe forms including APROP may show good regression with laser in only about 54.16% of eyes. Of the 39 eyes that underwent laser photocoagulation in our series, 32 eyes (82%) had a favorable outcome with or without additional anti-VEGF and surgery. To improve the outcome of treatment, many authors have recommended combination treatment with laser photocoagulation and bevacizumab in zone 1 ROP. This combination of treatment has been found to be particularly useful in eyes with severe ROP associated with vitreous or preretinal hemorrhage as seen in more than one-third of our cases. Vitreous hemorrhage is not only a sign of severe ROP but also prevents the adequate laser photocoagulation leading to unfavorable outcomes. Mintz-Hittner et al. in the BEAT-ROP clinical trial showed that bevacizumab had a significant treatment effect for zone 1 ROP (P = 0.003%). They found that the rate of recurrence of zone 1 disease alone was significantly higher with conventional laser therapy (42%) than with intravitreal bevacizumab (6%). Almost 30% of the zone 1 eyes treated in our study required bevacizumab. None of the eyes in our study were treated with anti-VEGF monotherapy. It is believed that although the initial response with anti-VEGF alone may be remarkable in these eyes, recurrences can be extremely challenging. Considering the distance involved in travel to a tertiary care center, follow-up of these infants was expected to be unpredictable. Hence, a combination of anti-VEGF injections with laser to peripheral avascular retina was given in all cases to prevent future recurrences. Vitreoretinal surgery resulting in good anatomic and functional outcomes in ROP-related retinal detachment has been reported. About 33% of the eyes could be managed successfully with laser with or without bevacizumab. The others, however, required surgery at some stage. Nineteen eyes (32.2%) underwent only surgery for retinal detachment. Of these, nine eyes had Stage 4 disease, with a favorable outcome being observed in four eyes (44.4%) and an unfavorable outcome was seen in five eyes (55.5%). In a previous study of LSV for Stage 4 ROP from our center, we reported a successful outcome in 74% of cases. In this series, although the numbers are small, successful outcome was seen only in 44%. Zone 1 is one of the poor biomarkers of the disease and is associated with poor final surgical outcomes. In the other ten eyes which had Stage 5 disease and were treated only with surgery, a favorable outcome was seen in three eyes (30%); poorer outcomes with Stage 5 disease are expected. Bevacizumab is often used as an adjunct to surgery to reduce vascularity and improve surgical outcome as was done in two of our cases. 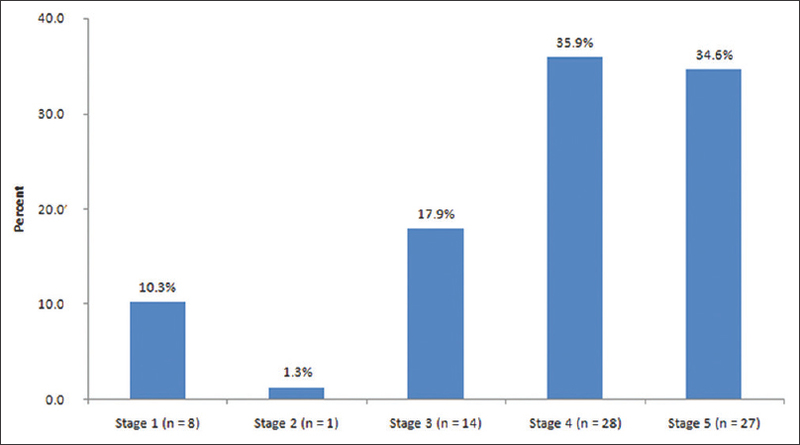 The highlight of our study is that it represents the entire spectrum of zone 1 ROP from Stage1 to Stage 5. This study presents the real-world scenario of treating zone 1 ROP in a tertiary care center where infants may be brought in late and at various stages of severity. In such a scenario, a prompt multipronged approach is necessary to treat these infants and salvage them from the unfavorable outcome of complete blindness. Lack of awareness is a major reason for the infants presenting with the aggressive form of ROP. In such situations, the management becomes challenging. We need to come up with more stringent guidelines for screening ROP so as to curb the progression at an early stage. That requires coordination between the pediatricians, ophthalmologists, and the community level health-care providers. Early detection and intervention can help in reducing the burden of childhood blindness. The study is limited by its retrospective nature, small sample size, and variable follow-up that may not allow significant subgroup analysis. Furthermore, the complexity and heterogeneity of the disease itself may not justify a statistical comparison. Of the 78 eyes studied, treatment was possible in 60 eyes (75.6%). Of them, 40 eyes (66.7%) had an attached retina at the final follow-up, indicating a structurally favorable response to treatment. An unfavorable structural response was seen in 20 eyes (33.3%). In addition to that, the first presentation at our center in nearly 77% of the eyes was after 6 weeks of birth. Zone 1 ROP is an aggressive disease with a rapid progression if left untreated. At the time of referral, laser was possible in only 50% of the eyes indicating the vital time lost. In some infants, even with advanced disease, the outcomes with early intervention in the forms of laser and intravitreal anti-VEGF agents can be favorable, reducing the need for surgical intervention. There is pressing need to train more personnel not only to screen but also treat ROP so that delays in referral and treatment are minimized. We would like to acknowledge Mr. Vishwanathan N and Ms. Ayisha Atiya for the help with the statistics. O'Keefe M, Lanigan B, Long VW. Outcome of zone 1 retinopathy of prematurity. Acta Ophthalmol Scand 2003;81:614-6. Dorta P, Kychenthal A. Treatment of type 1 retinopathy of prematurity with intravitreal bevacizumab (Avastin). Retina 2010;30:S24-31. Shin DH, Kong M, Kim SJ, Ham DI, Kang SW, Chang YS, et al. Risk factors and rate of progression for zone I versus zone II type 1 retinopathy of prematurity. J AAPOS 2014;18:124-8. Soh Y, Fujino T, Hatsukawa Y. Progression and timing of treatment of zone I retinopathy of prematurity. Am J Ophthalmol 2008;146:369-74. Cryotherapy for Retinopathy of Prematurity Cooperative Group. Multicentric trial of retinopathy of prematurity: Three-month outcome. Arch Ophthalmol1990;108:195-204. Early Treatment for Retinopathy of Prematurity Cooperative Group. Revised indications for the treatment of retinopathy of prematurity: Results of the early treatment for retinopathy of prematurity randomized trial. Arch Ophthalmol 2003;121:1684-94. Bhende P, Gopal L, Sharma T, Verma A, Biswas RK. Functional and anatomical outcomes after primary lens-sparing pars plana vitrectomy for stage 4 retinopathy of prematurity. Indian J Ophthalmol 2009;57:267-71. Nudleman E, Robinson J, Rao P, Drenser KA, Capone A, Trese MT. Long-term outcomes on lens clarity after lens-sparing vitrectomy for retinopathy of prematurity. Ophthalmology 2015;122:755-9. Chen SN, Lian I, Hwang YC, Chen YH, Chang YC, Lee KH, et al. Intravitreal anti-vascular endothelial growth factor treatment for retinopathy of prematurity: Comparison between ranibizumab and bevacizumab. Retina 2015;35:667-74. Mota A, Carneiro A, Breda J, Rosas V, Magalhães A, Silva R, et al. Combination of intravitreal ranibizumab and laser photocoagulation for aggressive posterior retinopathy of prematurity. Case Rep Ophthalmol 2012;3:136-41. Pejawar R, Vinekar A, Bilagi A. National Neonatology Foundation's Evidence- based Clinical Practise Guidelines 2010. Retinopathy of Prematurity. New Delhi: NNF India; 2010. p. 253-62. Jalali S, Azad R, Trehan HS, Dogra MR, Gopal L, Narendran V, et al. Technical aspects of laser treatment for acute retinopathy of prematurity under topical anesthesia. Indian J Ophthalmol 2010;58:509-15. Michaelson I. The mode of development of the vascular system of the retina, with some observations in its significance for certain retinal diseases. Trans Ophthalmol Soc UK 1984;68:137-80. Ashton N, Ward B, Serpell G. Effect of oxygen on developing retinal vessels with particular reference to the problem of retrolental fibroplasia. Br J Ophthalmol 1954;38:397-432. Jalali S, Kesarwani S, Hussain A. Outcomes of a protocol-based management for zone 1 retinopathy of prematurity: The Indian twin cities ROP screening program report number 2. Am J Ophthalmol 2011;151:719-2400. Shah PK, Narendran V, Kalpana N, Gilbert C. Severe retinopathy of prematurity in big babies in India: History repeating itself? Indian J Pediatr 2009;76:801-4. Gilbert C, Fielder A, Gordillo L, Quinn G, Semiglia R, Visintin P, et al. Characteristics of infants with severe retinopathy of prematurity in countries with low, moderate, and high levels of development: Implications for screening programs. Pediatrics 2005;115:e518-25. Vinekar A, Dogra MR, Sangtam T, Narang A, Gupta A. Retinopathy of prematurity in Asian Indian babies weighing greater than 1250 grams at birth: Ten year data from a tertiary care center in a developing country. Indian J Ophthalmol 2007;55:331-6. Sanghi G, Dogra MR, Katoch D, Gupta A. Aggressive posterior retinopathy of prematurity: Risk factors for retinal detachment despite confluent laser photocoagulation. Am J Ophthalmol 2013;155:159-6400. 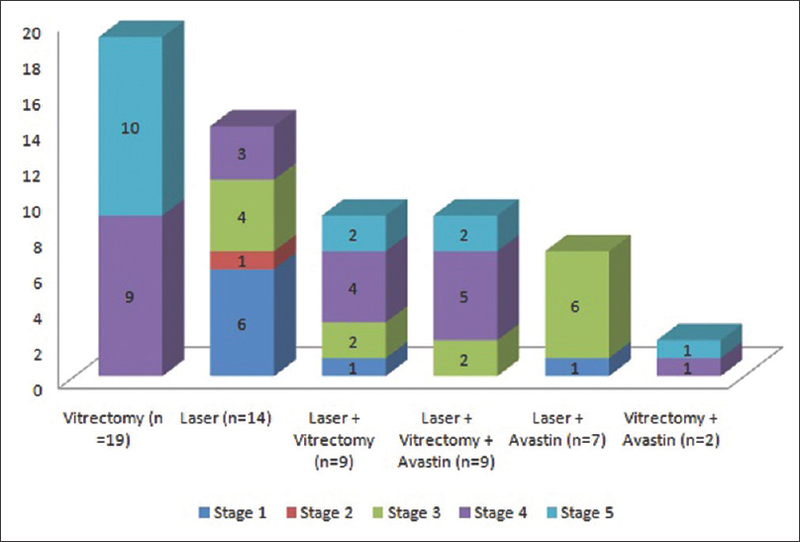 Nicoara SD, Cristian C, Irimescu I, Stefanut AC, Zaharie G. Diode laser photocoagulation for retinopathy of prematurity: Outcomes after 7 years of treatment. J Pediatr Ophthalmol Strabismus 2014;51:39-45. Wutthiworawong B, Thitiratsanont U, Saovaprut C, Subhangkasen I, Geyuraphun B, Ampornprut A, et al. Combine intravitreal bevacizumab injection with laser treatment for aggressive posterior retinopathy of prematurity (AP-ROP). J Med Assoc Thai 2011;94 Suppl 3:S15-21. Nazari H, Modarres M, Parvaresh MM, Ghasemi Falavarjani K. Intravitreal bevacizumab in combination with laser therapy for the treatment of severe retinopathy of prematurity (ROP) associated with vitreous or retinal hemorrhage. Graefes Arch Clin Exp Ophthalmol 2010;248:1713-8. Mintz-Hittner HA, Geloneck MM, Chuang AZ. Clinical management of recurrent retinopathy of prematurity after intravitreal bevacizumab monotherapy. Ophthalmology 2016;123:1845-55.